If you were lucky enough to live through the 60s (or if you just really love hippie culture) you’ll instantly recognize the above vehicle. For the uninitiated, it’s a 1962 Volkswagen T1 camper van – the very same van that young people seemed to love driving cross-country in a few decades ago. But of course, this one is made of LEGO pieces: 1,322 of them, to be exact. The van was faithfully recreated in painstaking detail, from the pop-up roof and aircooled rear-sitting engine to the hippie-inspired interior color scheme and lava lamp. 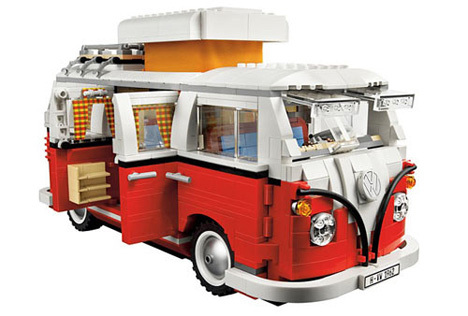 There’s even a T-shirt hanging in the window that encourages fellow motorists to “Make LEGO models, not war.” You will have to save up your pennies for a while to nab this model at $120, but that’s significantly less than most Star Wars kits and we rather think it’s well worth the price.